Snow flying action as a man, experienced at downhill skiing, descends the slopes at the Wildkogel ski area in the Pinzgau region of Austria. Skiing the snow covered slopes of the austrian alps this guy was really impressive with his skills in downhill skiing. 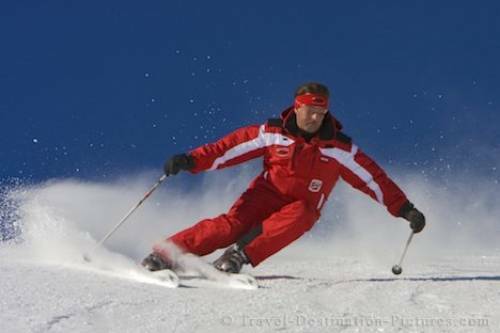 As a professional ski instructor for almost 25 years he had lots of opportunities to practice a driving style which would instantly lead to serious injuries for every tourist style skier around. The slopes of the Ski Arena Wildkogel offer something for beginners right through to advanced skiers. Advanced skiers can scale the heights of the slopes in the comfortable chair lifts and push off from the top in an action packed run to the valley floor. Action shot of a man downhill skiing at the Ski Arena Wildkogel, Pinzgau, Salzburger Land, Austria, Europe. Action picture of a man downhill skiing at the Ski Arena Wildkogel, Pinzgau, Austria, Europe.